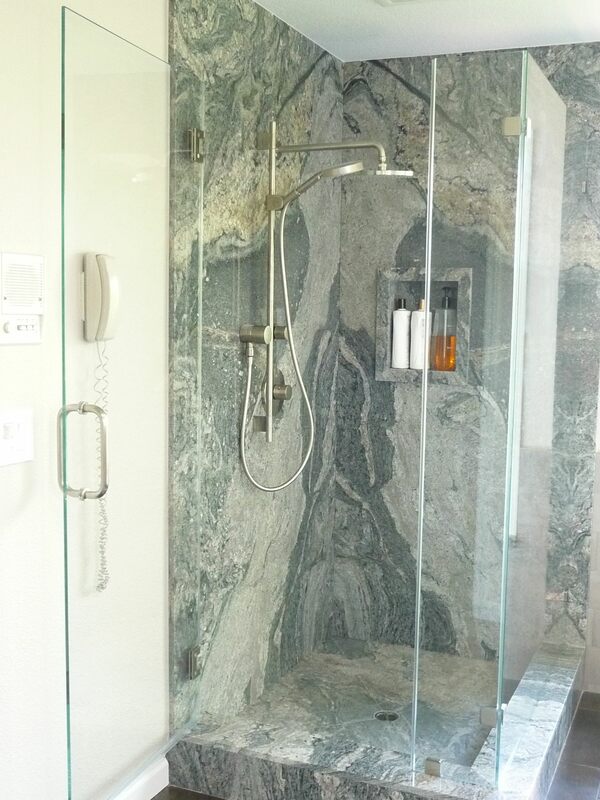 Valerie came to Artistic Stone knowing she wanted to update her three bathrooms in her Castro Valley canyon home. She came into our San Leandro Showroom with drawings and worked with Helen to get a budget and the overall project time line. In one of her master bathroom, she had a large jacuzzi tub which no one every used and she wanted to change it out to something newer. As for the other two bathrooms, one was a shower stall and the other was a tub shower. All in need of removing old tile or cultured marble. Valerie’s vision was to bring in a high end spa into her home. Helen helped her plan the installation time line with her general contractor to coordinate the city’s inspection. We staggered the installations so only one bathroom was out of operations at a time to way minimizing the impact the remodel has on the family while living at the house. Bring in your plans for a rough estimate. Artistic Stone will find the best sized slabs for your project to eliminate waste. Two book matched piece of Paracema White granite slab were picked so the left and right pieces would mirror each other. The shower pan was also made out of slab. The surface was honed and then pitched 1/4 inch so the water would drain properly. A slab shower is the truly a piece of art in your bathroom. This entry was posted in Installation Day, Bathrooms, Custom Installations. Bookmark the permalink.